With its heritage centred on the Royal Yacht Squadron at Cowes on the Isle of Wight, who organised the oldest sporting event in the world, the inaugural Americas Cup race called the "100 Guinea Cup' back in 1851. This race, starting off Cowes and racing around the Island. Back then a newly built yacht called 'America, was brought to the Solent to race. This new, some may say radical designed yacht took on a skipper who understood the tricky and fickle tides that flow around the island. There was apparently a difference between the sailing instructions and the advertised course for the race which 'America' took advantage of, saving some distance for her and she won the race, taking the cup back to the United States. The cup has been open to challenges since then. Initially the challenge yachts were built bigger and bigger until in 1928, Nat. Herreshoff came up with a design which became the J-Class - with a waterline length of 75 to 87 feet, (although overall lengths were in excess of 125 feet), and a mast that enabled a sail area of epic proportions. The first built was Shamrock V, designed and built by the Nicholson boatyard in Gosport to a commission by Sir Thomas Lipton, of India Tea Company fame. Only 10 of these beautiful classic sailing yachts were built to the class rules, six in the USA and four in the UK. Other yachts were adapted to the class and raced alongside the J class. For crew, as today, comprise around 30 people for racing - a great organisational challenge on board these thoroughbred machines. During the war years, many of the yachts were scrapped for the steel in their hulls. In the 1970's the start of a restoration of some of the yachts was made. Endeavour, one of the original yachts' hull was bought for £10 and restoration commenced. Another original Shamrock, was refitted at the yard in which it was built, Camper and Nicholson at Gosport in Hampshire. Velsheda was rescued from a mud berth on the River Hamble off Southampton Water and refurbished sufficiently to be chartered in and around the Solent. Endeavour was taken to the Royal Huisman yard in Holland for her rebuild to be completed. Shamrock V - after a period renamed as 'Quadrifoglio' - was purchased by Thomas Lipton Company, and taken to the Newport Museum of Yachting in Rhode Island, America. In 1989, Shamrock and Endeavour started racing each other over the old America's Cup course off Rhode Island. In 1997 Velsheda had a new owner and was rebuilt at Southampton Yacht Services in Hampshire. In 1998, Shamrock V, Endeavour and Velsheda raced each other in the Caribbean at Antigua Classic Week. 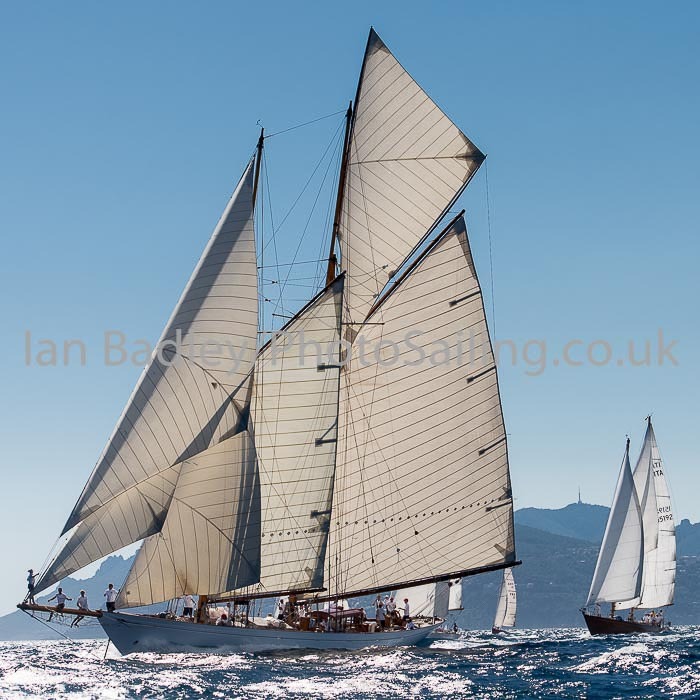 In 2000 the J- Class Association was formed, protecting the interests of the wonderful sailing yachts and the following year, the first J Class Regatta was held in Christchurch Bay off the Hampshire/Dorset Coast. Since then, new yachts have been built following the J Class rules and more yachts have been commissioned further burgeoning the class numbers.